Presented in fun and creative ways, team building exercises challenge your team members to step out of their comfort zones and force them to work together to solve certain tasks. Resistance among team members – whether a work group, sports team, or any group for that matter – can cripple efficiency and halt productivity. Therefore, it is the duty of any employer or team leader to eliminate resistance and fertilize growth. However, this is often easier said than done. How do you get two or more team members to set aside their personal differences and start working together for the good of the group, team, or business? No man is an island and just to prove it, we present to you “The Island,” a team building challenge designed to eliminate resistance among your group and fertilize collaboration and growth. Lessons Learned: You have to get your team members from “island” to “island” using only two planks. The hitch? There are more than two islands to get to. You’ve got to take the planks with you and ensure that everyone is moving together cohesively to reach the destination. “The Island” requires a tremendous amount of teamwork and problem solving. How will your team handle this challenge? Will they work together and make it to every island or will they struggle to work as a team? Who will take on leadership roles? 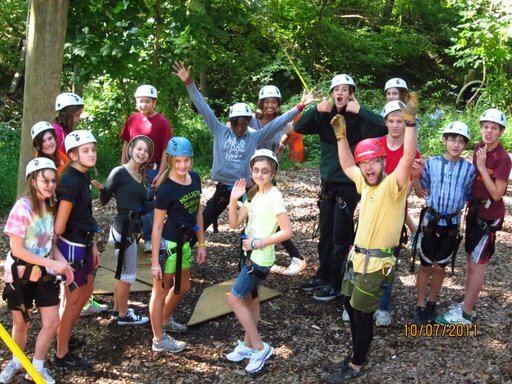 At Terrapin Adventures, we can help you and your employees unleash your full potential. “The Island” is just one example of the many different team building exercises that we use to help your team reach their full potential. Get in touch with a Guest Relations Specialist today and ask about how Terrapin Adventures can help you plan your team building event. Call 301.725.1313 or email us at info@terrapinadventures.com. You can also follow Terrapin Adventures on Facebook, Twitter, LinkedIn, YouTube, Google+, and Pinterest for up-to-date information on events, trends, and other fun and exciting outdoor activities. This entry was posted on Wednesday, May 13th, 2015 at 9:37 am. Both comments and pings are currently closed.